“Wicked Prayers” by S.D. Moore is a whirlwind tale of devilish horror that will keep readers’ hearts racing as fast as they are turning the pages. Suspense, humor, drama and unsettling terror–this book has it all–but, fair warning – it’s not for the faint of heart! On orders from her doctor to help induce labor, Elizabeth Holly recruits her teen-aged daughter Julia to accompany her on a walk. When they reach the home of crazy Old Man Wilson, Elizabeth suddenly starts vomiting, grabbing her stomach, and screaming with excruciating pain. Julia runs back home to get help, but when her and her father return, there is no sign of Elizabeth. Old Man Wilson kidnapped Elizabeth, calling her “his angel,” but John and Julia Holly soon wrest her free. During this time, Elizabeth has given birth to Waed (pronounced Wade) who grows into the Beast, an evil entity set on ruling Hell from Earth. Autumntown is soon infested with the foul creatures created by Waed, and no one is safe. “Wicked Prayers” certainly isn’t the type of book you will be able to put down once you start reading, so be mindful of the time of day. I like to read at night before settling down and found I definitely had to change my habits with this book. Reading too close to bedtime, I found I was unable dispel certain pictures from my mind enough to relax and unwind! Now that’s scary! I love the author’s writing style–clear, direct, and with purpose, every word enticing the reader to read on. I was lured in from the very first pages and remained hooked throughout the entire story. Well-written with vivid imagery, fast-paced action, and non-stop suspense, I was transported easily into the plot and setting. There are a lot of characters in this book and I’d advise readers not to get too bogged down in trying to remember them all. The main characters stand out significantly, with intricate personalities, and full of depth. 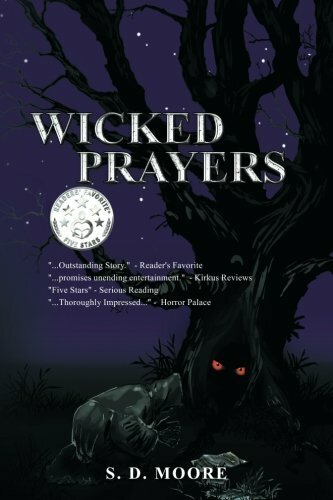 Greatly entertaining, terrifying, and captivating, “Wicked Prayers” by S.D. Moore is a 5-Star must read horror story that I highly recommend to satisfy even the most discriminating fans of the genre.